Employers who decide to implement a background screening process for job applicants, or engage the services of a third party to do it for them, will immediately discover an assortment of challenging and involved statutes, laws, and regulations. Ban The Box is an important regulation to be aware of, and it’s crucial for you to understand how it applies to your company. What is the Ban The Box? As of January 2015, Washington D.C. and over 100 cities and counties had adopted what are widely known as “ban the box” policies so employers consider job candidates’ qualifications first, without the stigma of any criminal record. So-called “Ban the Box” initiatives are meant to provide job applicants a fair chance by removing conviction history questions on job application forms and delaying background check inquiries until later in the hiring process. 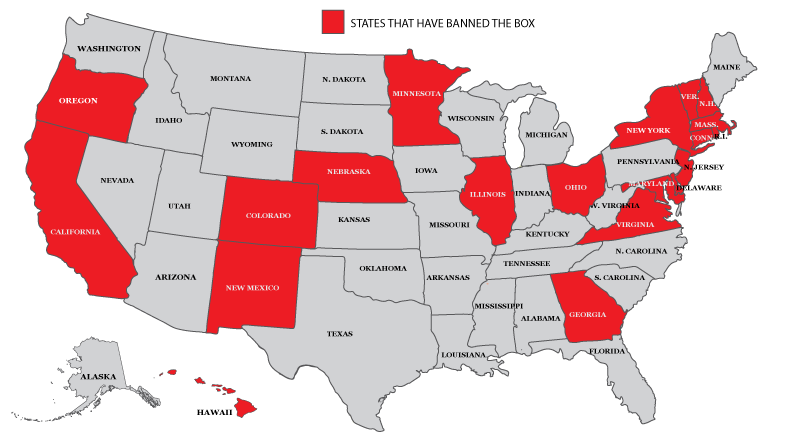 The following states have adopted “Ban the Box” policies to some extent. In 2012, the Equal Employment Opportunity Commission (EEOC) issued a new guidance document on criminal conviction exclusion policies. This guidance endorsed removing conviction questions from job applications as a “best practice” and made it clear that federal civil rights laws regulate employment decisions based on arrests and convictions under Title VII of the Civil Rights Act of 1964, as amended. 2. Avoid blanket exclusions and instead include an equal opportunity statement on job applications. 3. If a criminal record is uncovered, only consider convictions with a direct relationship to job duties and responsibilities and also consider the length of time since the offense. 4. Ensure that each applicant receives an individualized hiring assessment without reference to any past conviction history. 5. Remove pre-hire inquiries into convictions from job application forms. 6. Remove pre-hire self-reporting questions about an applicant’s prior conviction history. 7. If a job applicant is rejected because of a past criminal record, inform the applicant of that fact. 8. Provide the applicant the right and sufficient time to submit evidence of mitigation or rehabilitation regarding any past convictions. 9. Be aware of when states expand the “fair chance policies” to private employers. 10. Combine criminal conviction data collection and effective enforcement. SELECTiON.COM® provides the comprehensive and customizable screening solutions needed to navigate the legal aspects of background screening. We stay up-to-date with all EEOC, FCRA and Ban The Box regulations and provide you with all of the forms you need on our proprietary system, Fastrax Select®. Our system allows employers to stay compliant and provides clients with the ability to follow the background check process from start to finish. Our Applicant Entry system will obtain accurate information straight from the applicant, as well as an electronic release form. Contact us today to see how SELECTiON.COM® can take your employment background check process to the next level. NOTE: The contents of this White Paper are not legal advice for your particular situation. You should neither act nor rely upon anything stated in this document without first consulting your own legal counsel. Download a PDF copy of this White Paper.